Piety is a character trait and a word that we don’t use so much in our day and age. A pious person is another way of defining someone who is devoutly religious. Some other words that might be substituted for pious are: devoted, God-fearing, spiritual, prayerful, holy, godly, ministerial, saintly and even sometimes “holier-than-thou”. 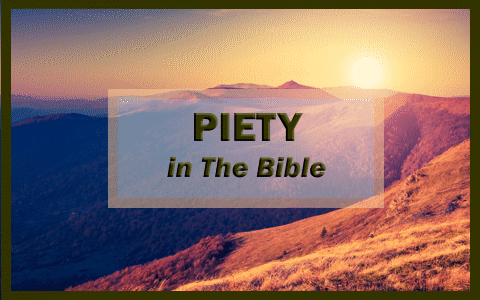 The Bible is filled with people who display an attitude of piety and here are just one dozen examples of piety in the Bible. Acts 22:12–13 And one Ananias, a devout man according to the law, having a good report of all the Jews which dwelt there, Came unto me, and stood, and said unto me, Brother Saul, receive thy sight. And the same hour I looked up upon him. Luke 2:36–37 And there was one Anna, a prophetess, the daughter of Phanuel, of the tribe of Aser: she was of a great age, and had lived with an husband seven years from her virginity; And she was a widow of about fourscore and four years, which departed not from the temple, but served God with fastings and prayers night and day. Acts 11:22–24 Then tidings of these things came unto the ears of the church which was in Jerusalem: and they sent forth Barnabas, that he should go as far as Antioch. Who, when he came, and had seen the grace of God, was glad, and exhorted them all, that with purpose of heart they would cleave unto the Lord. For he was a good man, and full of the Holy Ghost and of faith: and much people was added unto the Lord. Acts 10:1–2 There was a certain man in Caesarea called Cornelius, a centurion of the band called the Italian band, A devout man, and one that feared God with all his house, which gave much alms to the people, and prayed to God alway. 2 Chronicles 31:20 And thus did Hezekiah throughout all Judah, and wrought that which was good and right and truth before the LORD his God. John 8:28–29 Then said Jesus unto them, When ye have lifted up the Son of man, then shall ye know that I am he, and that I do nothing of myself; but as my Father hath taught me, I speak these things. And he that sent me is with me: the Father hath not left me alone; for I do always those things that please him. So many words can be used for that word “piety” that we don’t use so much today. Simply put, if you are loyal, reverent, godly and love the Lord with great zeal, you might be considered pious yourself. More reading for you on a related topic: How Does the Bible Define Righteousness? Previous post: What Is Missiology? Next post: What Are The Unsearchable Riches Of Christ?